Homeschool record keeping is important because it may be the only available records of your child's education. While some school districts require copies of the records to be submitted in the form of quarterly reports, other districts don't require any paperwork whatsoever. There are a number of reasons to keep records of your child's academic achievements, starting with the prospect of a college education. One of the most important reasons you'll want to keep records of your child's educational achievements is so that they may be able to attend college one day. For children receiving an education in the public school system, they have a diploma to prove that they graduated from school. Children who have taken the GED have a certificate to prove they met the graduation requirements. What about homeschooled children? Homeschooled children have evidence of their education if' their parents have kept accurate records and assigned letter grades for all of the course work they have completed. The easiest way to do this, even if you aren't required to do so by your local school district, is to keep records, just like the public schools do. Amazon.com - find a variety of teacher's planners at discount prices from many different publishers. Donna Young - this site has quarterly report cards, daily assignment sheets and weekly assignment sheets to download for free. Teacher Forms - this site features 22 free forms created especially for teachers. Choose from cumulative records, yearly goals, high school transcript and much more. Quarterly reports - these reports give the reader a quick synopsis of what the child did for each class they took for a given quarter. This report should also include who taught the class and what letter grade the child received. 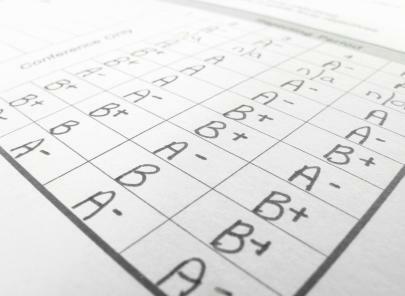 Grade reports - if your quarterly reports are rather lengthy, a shortened grade report provides a reader with a snapshot view of a child's progress, broken down by subject and the letter grade they received each quarter during a given year. It should also include the final letter grade given at the end of each year for each subject. The person who assigned the grades should sign this report. Goals - many teachers, including homeschool teachers, create a goal list at the beginning of each school year for each grade level. Daily and Weekly Planners - depending on how you run your classroom, a daily or weekly planner can help keep you on schedule to cover certain subjects within each quarter. Even though homeschool teachers and students often deviate from a curriculum, the planner serves as a reminder of current and future goals. If a child should decide to enter college at some point during their lives, the academic record you create will be the only thing they have to prove that they completed the required basic subjects. Many colleges are beginning to recognize homeschool records as legitimate and are increasing the number of these students that they accept each year. However, they expect the records to be easy to read, thorough and professional. Even if a child doesn't attend college, he may still need to prove that he completed a high school education when applying for certain jobs. Many states are required to accept homeschool records as proof of graduation. Homeschool record keeping doesn't have to be difficult if you have the right tools for the job. Choose a simple planner that helps you cover all of the subjects you teach, has room for your notes and a place to keep track of grades. The planners don't have to be fancy; they just need to get the job done. Remember, the records you keep today can have an impact on your child's future tomorrow.